Funded by a $1.3 million grant in 2014 from the Andrew W. Mellon Foundation, the Chicago Objects Study Initiative (COSI) brings together the Art Institute of Chicago and the Departments of Art History at Northwestern University and the University of Chicago in a transformative approach to objects-based studies in Art History. In April 2018, the grant was renewed for another five and a half years in the amount of $1.86 million. The ambition of COSI is to provide graduate students with new or significantly enhanced coursework and training in objects-based research, and with increased access to objects drawn from the Art Institute’s renowned permanent holdings and to the expertise of the museum’s professional staff. The effort addresses a disciplinary and professional need for broadening instruction, with an emphasis on curatorial practice, objects-based research, and technical Art History, including in-depth exposure to conservation and conservation science approaches to objects and materials. The program aims to prepare graduate students to consider art objects as primary objects for original research in the discipline of Art History regardless of the career paths they may pursue. Introducing more intensive and direct study of objects into their practice at a formative moment, the program provides graduate students with the tools, skills, and experiences that prepare them for positions in museums, libraries, or other research settings involving collections. This course takes place during the Winter quarter of each academic year and is required of all first-year graduate students in Art History at both Northwestern University and the University of Chicago. The course provides students with basic grounding in object-based research to enrich their scholarship and broaden their career horizons and is team-taught by a faculty member from each Art History department and alumna Jill Bugajski, Executive Director in the Department of Academic Engagement and Research at the Art Institute. This internship is intended to provide a graduate student in her second, third or fourth year of study with significant, sustained experience in curatorial practice. Positioned at the early stages of the dissertation process, this fellowship has the potential to aid the fellow in formulating a research agenda oriented towards object-based concerns. The intern works within a curatorial department at the AIC under the supervision of both the Mellon Academic Curator and their host department's curatorial staff, assisting with the current research needs of the department. 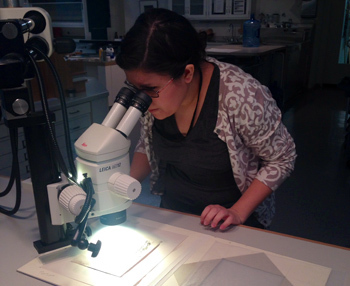 To date, Northwestern interns have been placed in a range of museum departments working on medieval, early modern, modern, and contemporary projects. The COSI Curatorial Research Fellow is an advanced graduate student who spends a year in residence at the Art Institute working closely with a curatorial mentor. Fellows and museum curators are matched via a collaborative process involving all three institutions considering a Fellow’s career stage and research interests and given the curator’s work plans and expertise. The Fellowship also provides funds for research-related travel. Alumna Maureen Warren, now Curator at the Krannert Art Museum, was the inaugural COSI Fellow. Our most recent COSI Fellow, Antawan Byrd, began a position as Assistant Curator in the Department of Photography at the Art Institute in September 2018. 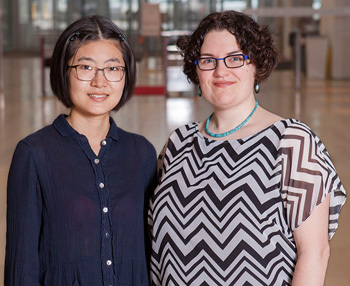 COSI Mellon Intern Xinran Guo (left) and COSI Mellon Fellow Maureen Warren (right). Beginning in Spring 2018, one advanced graduate student will offer an annual, stand-alone seminar for Northwestern undergraduate students taught with objects from the Art Institute. The inaugural seminar will be led by C.C. McKee and focus on the museum’s stellar collection of nineteenth-century art.